Bhubaneswar: Making the popularity of the city heritage walk felt in every sphere of life, today Ekamra Walks has a varied group of walkers including students from Regional Institute of Education (RIE), foreigners currently working in Odisha, a sculptor from Vadodara, a city-based helicopter pilot and a senior advocate from the Supreme Court of India. 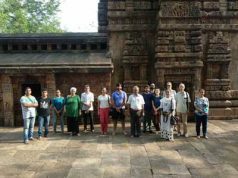 Today Ekamra Walks had 65 visitors including 17 students from RIE, Bhubaneswar, three from ICICI Academy of Skills, Bhubaneswar, 10 tourists from Andhra Pradesh, two from Canada, one from US, one artist from Vadodara and two from Delhi. Helicopter pilot Prateek M. Shah, who is originally from Gujarat, but staying for two years in the Temple City, was grounded today completely as he was overwhelmed with the beautiful monuments of the city. Shah, who pilots a copter of Indian Metals and Ferro Alloys, was accompanied by his naturopath mother Manisha Shah. She also said that the Ekamra Walks today opened a plethora of possibilities for the mom and son duo to explore in near future. Rebeca Arbor and Rebeca Thomson from Canada, who came here for the Ekamra Walks today said “despite the severe humidity we thought of participating in the event as we are getting connected to Odisha as we are working for tribals and farmers for conserving the ancient farming traditions to have a sustainable development growth. 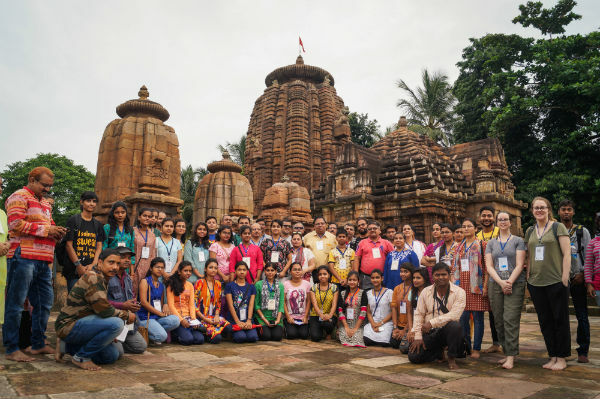 Kannan Siripurapu, originally from Andhra, but was staying in the US till recently, is now working in Odisha for tribal development and working in an organization Nirman, in which the girls from Canada are working as interns. 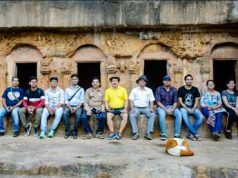 Awdhesh Tamarakar, from Vadodara and a trained sculpture, who is in city to attend a residency programme with Utsha Foundation, said “the first visit to Odisha and especially to the city and the monuments were really wonderful. As a sculptor I would rate it as one of the best in the nation. 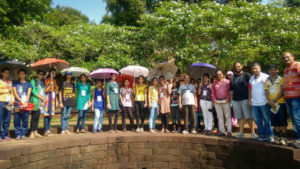 Rajashree Mohanaty, Ranjita Tripathy and Beura Krishna Himanshu, all students of ICIICI Academy of Skills, Bhubaneswar, said “we are the fourth group from out institution. I hope as the walk has gradually gaining ground, we may come with more students as they are liking the show very much.